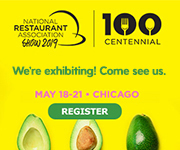 For 100 years, the National Restaurant Association Show is where attendees have come to hear it, see it, and taste it, first. We’re excited to have you as a part of the biggest party of the century. Cheers to 100 more years of shaping the industry! Determine your target audience, competitive advantage, and market position. Drive traffic to your booth by adding a Show Special to attract attendees (such as 10% off orders taken at Show, free shipping, etc.). Order lead retrieval through Exhibitor Services to help your booth staff capture leads on site. Utilize Show marketing materials. Download general marketing collateral such as web banners, logos, and more to update your website and email signature, tell customers you’ll be at Show. Engage with Show attendees via social media on Facebook, Twitter and Instagram by tagging the National Restaurant Association Show. Rent the attendee list and invite prospective customers. Available in the Registration Services section of Exhibitor Services. Consider sponsorship opportunities to increase your on-floor exposure. Ask our sales team how sponsorship opportunities can increase your Show exposure and drive traffic to your booth. Utilize Show public relations—fill out the PR Form and tell us about unique products, special in-booth demos, celebrity appearances, etc. to include in Show promotions. Pursue those leads while they are hot. Organize your leads and reach out within two weeks post-Show. Rent the Attendee List after the Show and send a follow-up to all attendees in your target to thank them for coming. Attach sales information in case they missed your booth.